Normal mapping and vertex-displacement mapping from the same texture. This ones uses the Kineme texture tools to create the displacement texture. It’s a classic use of the technique. Not sure I’ll ever use this one ‘in anger’ but it’s an interesting test. I’m glad the lighting works so well, too. 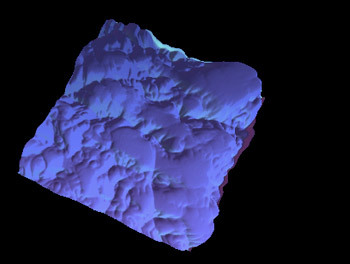 The base colour comes from the normal map, incidentally. Next I have to work out if I can use the same technique with radial displacement. Think that might be a bit more tricky. That looks amazing. Can it be manipulated? Very nice work! 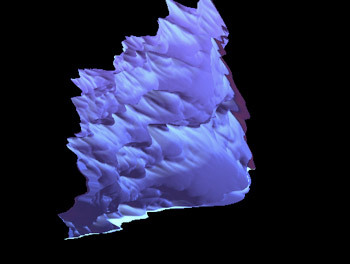 I was going through maybe all glsl-mesh-related vertex displacement stuff for quartz composer. How did you do the above example? Where does the displacement come from? From inside a glsl-vertex shader? the displacement comes from a still image, as far as I remember. The image is fed into the Vertex Shader as a Sampler2D, and used to displace the position of the vertices. 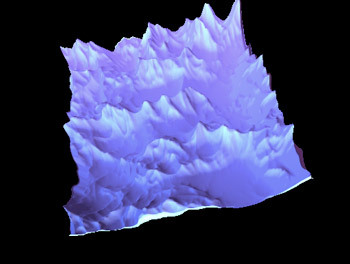 The same displacement image is also used to generate a normal map for lighting. It’s actually a failed experiment though, as the lighting doesn’t work properly except from a narrow range of angles. I plan to go back to this at some point. Ultimately, I think using a heightfield-type plugin is the way to go, rather than using Vertex Shader displacememtn-mapping, which will always fall back to CPU-rendering, unfortunately.